"A relationship based on trust is the best way to start a great journey with your dog"
Barbara Hodel is the owner of Good Dog Positive Dog Training which services Sydney's Northern Beaches and Lower North Shore. Sharon believes you can train your dog for their entire life but you only have a short window of opportunity for socialisation. So take your puppy out and about in a safe way as much as you can and expose them in a positive way to all the things they might have to deal with later in life. "Do no harm – both to dogs and their handlers"
Lynette's main training tip is "Do no harm – both to dogs and their handlers and don’t assume that everyone will have the same ideals as you – you will win some and lose some along the way! "Remember that positive reinforcement applies to the owner as well as the dog"
Jason is a Delta dog training graduate who is passionate about helping you and your dog. He says "I want to be the best trainer I can in a force free environment. Unfortunately, too many dogs are needlessly surrendered or euthanised, simply because their owners do not know how to communicate effectively with them". Rainbow Dog Training is located in Sydney. Jason specialises in Puppy Classes, Adult Dog Training, Private Consultations and strives to give owners the tools they need to talk with their animals. "I am passionate, friendly, but realistic"
Sue is a Delta dog training graduate who is passionate about helping you get the best from your dog with training that is, fun, friendly and humane. She says "I am passionate, friendly, but realistic. I understand that you want a well behaved pet dog, but may not know where to start, what to do or are overwhelmed by it all. At Ellie Dog we will help and guide you through the process, step by step". Ellie Dog is located in Lane Cove, Sydney and specialises in private consultations, puppy and adult dog classes. Ellie Dog training school only uses positive training - which means it is fun, friendly and humane for your dog and easy for you to train all those behaviours you need to make your relationship work. "Be in a good frame of mind before training your dog. It should be fun for you both!" After 20 years as a dog trainer, Jennifer Alleyne has worked with a variety of breeds. But it was a rescue dog named Ollie, who suffered from anxiety based behaviour issues that really inspired Jennifer’s love for dog training. She combines that first-hand experience with the proven technique of positive-reward training to help other dogs like Ollie to communicate and learn new acceptable behaviours that help them to have a quality relationship with their human family. Jennifer is a graduate of the Certificate IV in Companion Animal Services through Delta. Helping Hounds specialises in private consultations, puppy classes, k9 Nose Work® classes and fun agility canine games. "If you build a happy trustful relationship with your dog, training behaviours follows much more easily"
Margaret has over 25 years experience in dog training. She has a Bachelor of Arts and a Diploma of Education plus a Certificate in Companion Animal Services from the Delta. She believes that if you understand your dog’s nature and needs, and know how to train, you’ll have a happier dog and one who is eager to learn the things you want to teach. Tails Up Dog Training specialises in puppy classes, senior puppy classes, foundation skills adult dog training, life skills dog training classes and private consultations. "Your dog will be part of your family for a long time. By spending a small amount of time training your dog now, you can ensure that you have a well-behaved companion for many years to come"
Alexis is a nationally accredited Dog Behavioural Trainer and holds a Certificate IV in Dog Behavioural Training. She believes there are definite advantages to positive motivational training. It is kinder and less stressful on your dog and is a natural learning process. Reward based training also builds a closer relationship between owner and dog making them more likely share an enjoyable, enduring bond. Scholars in Collars specialises in puppy classes, senior puppy classes, foundation skills adult dog training, life skills dog training classes, private consultations, workshops and seminars. 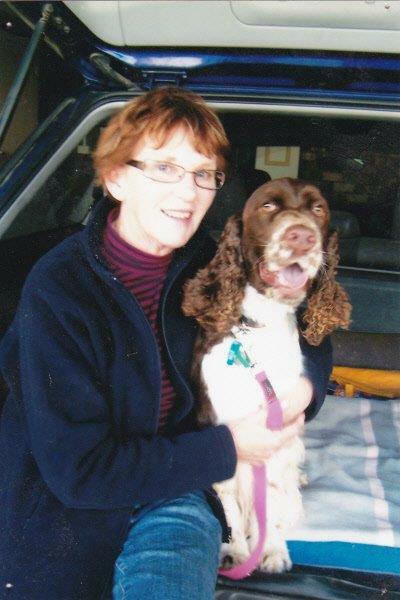 Alex began instructing at her local Dog Club in the mid 1990's and became hooked on helping people train their dogs. In 2003 she gained her Certificate IV in Behavioural Training through Delta and was able to implement much of what she learned into the local dog club training. In 2010 she was in a position to devote more time to helping people with their dogs including running and assisting with training classes at Pooch Professionals. Alex and her dog Roxy became a Delta Therapy Dog team in 2011, where they continue to visit Aged Care facilities. In 2012 Alex received certification in Canine Remedial Massage. In 2013 she became a Greenhound Assessor and works with Greyhounds As Pets assessing their dogs and any others who come from other welfare facilities.